Three years ago this week, I took a leap of faith when I left behind a long career in journalism to become the communications director for Hillel International, the world’s largest Jewish campus organization. I believe in Hillel’s mission, but I worried that leaving journalism meant the end of telling great human interest stories – stories about people who change, grow and overcome obstacles. Three years into my job, I find that these stories are all around me. 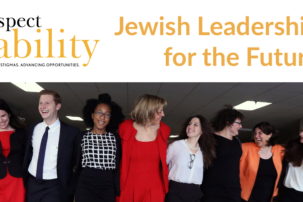 You will probably not be surprised to learn, as a supporter of RespectAbility, that some of the most compelling Hillel stories involve disability inclusion. In his speech at Hillel International Global Assembly in 2015, Hillel International President and CEO Eric D. Fingerhut announced a new partnership with the Ruderman Family Foundation that would train our student engagement interns to do outreach to students with disabilities and help build more inclusive communities on campus. When we say we aspire to reach every Jewish student, “we mean every,” Fingerhut said. In doing so, Fingerhut invoked the spirit of Sukkot, the Jewish festival we observe this week. During Sukkot, Jewish people dwell in a Sukkah, a temporary shelter covered in natural materials, for seven days. There are specific requirements for a Sukkah to be considered kosher, but there is no legal limit to how wide or long a Sukkah can be. Jewish tradition makes room for a large, open tent. How inclusive and welcoming we make that tent is limited only by the bounds of our imagination and our empathy. At Hillel, our students are showing us the way. Diagnosed with autism at a young age, Ohio University student Jordyn Zimmerman was unable to communicate for years. Even after discovering that she could communicate with the use of an iPad, she spent her first Rosh Hashanah away at college alone in her dorm room, crying. After one coffee conversation with a Hillel staffer, she got connected to other Jewish students, who brought her to Hillel. She soon found herself there every Friday night, engaging in extensive conversations on her iPad and surrounded by friends during song-filled services. She found her voice. With Hillel’s encouragement, Jordyn has become a successful student engagement intern on campus and was recently elected co-chair of Hillel International’s Student Cabinet. 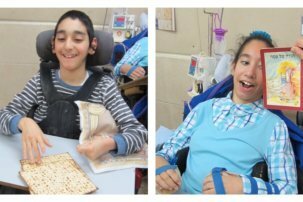 Daniella is a Ruderman Inclusion Ambassador for Hillels of Westchester this semester. 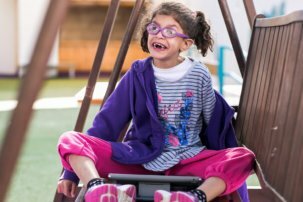 She has worn hearing aids since she was a child. As a student who’s hearing impaired and knows how it feels to be left out, she said, her job is to make sure that students on her campus never are. Every day, I meet more Hillel students who are finding their voice and using it to build more inclusive campus communities, to widen the tent. Three years have passed since I joined Hillel to find and tell these stories, and I’m not looking back. Geoffrey W. Melada is the director of communications for Hillel International and a former editor-in-chief of Washington Jewish Week. Follow him on Twitter @geoffreymelada.